The Australian Computer Society Professional Year Program was developed by the Australian Computer Society and approved by the Department of Immigration and Border Protection, which grants five migration points to graduates upon successful completion of the course. The ACS Professional Year Program is for international students who hold an Australian Bachelor or Master Degree in IT or ICT as a result of a minimum of two years of study within Australia. It provides a pathway from university to professional employment in Australia by developing the professional and practical skills required to work in the Australian IT industry. In addition to completing the Course Outline, The Australian Computer Society requires students studying the program to complete an online Professional Environment course while they are in their Internship. This program was developed and is managed by The Australian Computer Society. The Communication and Performance in the Australian Workplace component which focuses on working in teams, participating in office meetings, negotiating, and preparing presentations. 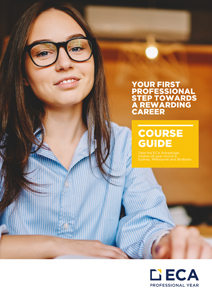 Entry and Advancement in the Australian Workplace which helps students develop their awareness of networking and career entry and planning, including the preparation of application cover letters, resumes, and interviewing skills. The Internship Placement which provides practical ICT workplace experience in an Australian-based organisation doing work relevant to your field of expertise. The Professional Environments Course which facilitates group discussion around project management, professional ethics, and risk aversion under the guidance of an expert ICT mentor and tutor. Completion of this program will provide the ECA Professional Year graduate with 5 points under the Skilled Occupation List, as specified by the Department of Immigration and Border Protection. During your ECA Professional Year course, you will study the following modules to help prepare you for the Australian workforce. This unit will equip you with an understanding of how to operate within the Australian workplace. It introduces you to the norms and protocols of the Australian Workplace and will make you aware of your rights and responsibilities, and what is expected there. It also describes the knowledge required to implement and monitor an organisation’s work health and safety (WHS) policies, procedures and programs to meet legislative requirements, and those needed to recognise and work productively with diversity in the workplace. This unit equips you with the skills necessary to collect and analyse information to communicate effectively in the workplace. This unit also covers business networking and promoting, establishing and maintaining positive relationships in the workplace. This unit focuses on developing your teamwork, time management and organisational skills through a group project. It also helps you to develop creative and critical thinking skills. This unit also looks at the skills and knowledge required to be a productive member of an innovative team, as well as working with others in a diverse team environment. This unit develops the skills and knowledge necessary to tailor your job application for a specific position. It describes how and where to find suitable job advertisements and how to analyse and successfully address job requirements in a job application. It also includes how to write an effective cover letter and resume. This unit develops the skills and knowledge necessary to prepare and successfully participate in an interview. It includes techniques such as predicting likely interview questions and participating in mock interviews, as well as advice on how to dress and behave in meetings, as well as the different stages of a conversation during your interview. ECA Professional Year participants will be expected to attend meetings in their internships and later in their professional positions. Depending on the organisation, they may be expected to organise meetings early in their career. This unit ensures that participants feel comfortable joining and participating in meetings. It covers the administration side of organising meetings, the expectations of meetings in Australia, behaviour and communication in meetings, language and roles. This unit enhances ECA Professional Year participants’ communication skills with customers (whether this is with internal or external customers); this requires the cultural sensitivity and language to be able to build rapport and ensure there are no miscommunications. ECA Professional Year participants may be required to provide a presentation at the end of their internship. Presentations are often used in the workplace to present new ideas or give a verbal summary of a project. This unit prepares participants to present articulately, address the audience effectively, provide appropriate content and structure and assess their presenting style. This unit requires participants to write a business report and to write workplace emails. The skills you learn in this competency are essential and will be used on a daily basis in your future career. Often colleagues and clients make contact first by email, and an initial impression of the person is created by that email. Employers have high expectations of written documents; expecting error-free reports written in a logical structure. This unit requires and assists you in improving your written English. This unit requires you to receive work instructions from a manager and then research and analyse information and report back your findings. Taking responsibility for a specific research task is a likely requirement of the internship and your early career days. Participants have to understand their instructions, find relevant information and report back information in a way which makes sense to the manager. As part of the ACS Professional Year Program, students are placed in internships in reputable Australian companies for a period of up to 12 weeks (240+ hours). Internships are designed to provide a practical understanding of working in the Australian professional workplace while giving students the chance to utilise their university knowledge. These internships are organised and managed by our own dedicated and supportive internship team, which has partnered with leading host companies such as Fuji EXRO, the ANZ bank and the Australian Taxation Office (ATO). As part of the ECA advantage, your placement into an internship will be hassle-free, as our supportive internship team will find you suitable a placement and manage the entire internship process. If you wish to use current employment for an internship placement, however, the team at ECA can also facilitate that option. Since it was established, our internship department has provided many jobs and networking opportunities for ECA graduates, with many internships resulting in permanent positions. Free professional job search support for your first professional position. One on One Tutorial sessions to work on any academic area you require. Free industry workshops in the use of programs relevant to your future employment: XERO, MYOB and other Microsoft products.